We report the first case of a wearable fitness tracking device, capturing an out of hospital cardiac arrest. A previously healthy 37 year old man, with no risk factors, sustained a cardiac arrest whilst running a half marathon. During the event, he was using a fitness tracking device (Fitbit Surge, Fitbit Inc. San Francisco). The time and location of the arrest was determined from the Fitbit data when the pace fell to zero, indicating a lack of movement (Figure 1). Interestingly, at the time of the arrest the heart rate decreased but did not fall to zero as expected. These heart rate inaccuracies may be related to cardiopulmonary resuscitation (CPR) interference. In the future, this wearable fitness tracking device data could be vital for the emergency services at the time of a collapse; locating a patient/athlete using the device’s GPS location service and estimating the patient’s ‘down time’ prior to return of spontaneous circulation (ROSC). This has the potential to improve post arrest care. As fitness products become more advanced and affordable with wireless/cellular connectivity, there is opportunity for their wearers and subsequently medical professionals to be made aware of subclinical heart rate abnormalities; tachycardia or bradycardia. In high risk individuals wearing the device, emergency services could be dispatched to its location if malignant rhythms are coupled with lack of movement and users do not respond to a challenge from the dispatcher. Keywords: Cardiac Arrest, Arrhythmias, Tracker, Wearable device, Mobile Health. A thirty seven year old gentleman suffered a cardiac arrest whilst running a half marathon. Bystanders initiated near immediate CPR and paramedics diagnosed pulseless electrical activity (PEA). As per ALS guidelines 1mg of Adrenaline was administered. Subsequently, he developed ventricular fibrillation (VF) and received one 200J biphasic DC shock before return of spontaneous circulation (ROSC). On admission to hospital it was noted that he was wearing a fitness tracking device (Fitbit Surge, Fitbit Inc. San Francisco) and with consent from his family we proceeded to interrogate the device to see what information it contained. Data was collected from the Fitbit app, an interface for all Fitbit devices to upload and store activities via Bluetooth. Within the app we reviewed the patient’s exercise map, pace, heart rate and speed displayed graphically. Figure 1 demonstrates the point of cardiac arrest through a drop in heart rate and a simultaneous lack of movement displayed in the pace graph. 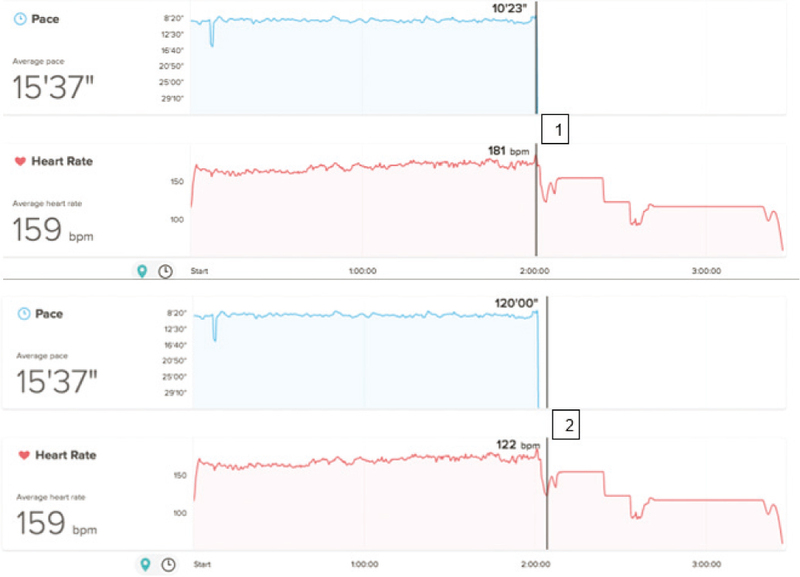 Figure 1: Showing the Fitbit Surge data; y axis showing average pace (minutes) and average heart rate (bpm), x axis; time (hours). Box 1 indicates the point at which the patient collapsed and Box 2 indicates the change in heart rate. During his post arrest care on the Intensive Care Unit (ICU) he was investigated for the cause of his cardiac arrest. He had a markedly elevated cardiac troponin I 4884 ng/L (<0.01 ng/L) and creatinine kinase 1156 U/L increasing to 51507 U/L (24-195U/L). He was treated with the rhabdomyolysis protocol. He had a normal CT coronary angiogram, echocardiogram and cardiac MRI. His CT and MRI brain were normal. He was successfully extubated on day three. He was discharged with a newly fitted implantable cardioverter defibrillator (ICD) after 13 days of hospitalisation. He had a Glasgow Outcome Score of five indicating an excellent recovery. We report the first case in the literature of a consumer wearable fitness tracking device capturing the point of cardiac arrest. The Fitbit Surge detects pace and location using GPS and has a 3 axis accelerometer and altimeter to detect movement and elevation1. The time of the arrest was detected when the pace dropped to zero, indicating a lack of movement, Figure 1. Simultaneously, the heart rate also showed a significant drop, Figure 1. The device measures heart rate by using ‘PurePulse™’ LED light. These reflect onto the skin to detect blood volume changes1. Stahl SE, An H-S, Dinkel DM et al studied the validity of heart rate monitoring of a Fitbit Charge during exercise. The results showed that if worn correctly, heart rate data was accurate2. Given the initial rhythm of PEA one would expect the heart rate to drop to zero at the point of cardiac arrest. However, this is not the case. Fitbit documents inaccuracy of heart rate through physiology, location of wear, type of movement and gives guidance on how to wear the device to improve accuracy1. It is possible the rapid initiation of CPR may have caused interference, or indeed the restoration of a perfusing circulation which may mimic the intrinsic pulse. The Fitbit Surge data showed no evidence of the absence of a pulse, despite documentation of the lack of a perfusing rhythm on the paramedic’s cardiac monitor. Unfortunately, no ECG tracings were available from the event. In this case of a fitness tracking device being worn during a cardiac arrest the most useful information gained has been time and location of arrest. If the time of ROSC had been documented at this arrest, an accurate calculation of ‘down time’ could have been made for the individual (Figure 1). The authors foresee that with the development of these devices and increased frequency of use, there will be a role in identifying more benign disturbances of pulse in the asymptomatic population. Wearable devices are being investigated to discover their potential value in meeting the health needs of the population3. Furthermore, in those at higher risk, in combination with a mobile phone, these devices may use lack of movement coupled with malignant rhythm detection to prompt a challenge to the wearer in the form of a phone call or device interaction to stand-down the dispatch of emergency services to the device’s GPS location. From the patient’s perspective, this gentleman now uses his fitness tracking device to monitor his heart rate out of hospital regardless of whether he is exercising. The device offers him both heart rate monitoring and psychological support. Thank you to the patient for allowing the authors to write up this case and allow interrogation of the Fitbit Surge data to gain information about the cardiac arrest. 3. Erdmier C, Hatcher J, Lee M. Wearable Device Implications in the Healthcare Industry. J Med Eng Technol 2016;40(4):141–8.